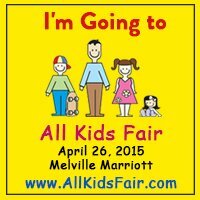 The popular “All Kids Fair” returns to the Melville Marriott for the fifth straight year on Sunday, April 26, 2015, from 10:00 a.m. to 4:30 p.m. The All Kids Fair is a combination of education and activities expo and health and wellness fair. It offers entertainment choices for toddlers through high school, including kids who have special needs or are gifted. Over 80 exhibitor spaces and many classes provide valuable information for kids and their parents and grandparents. Exhibitors will cover schools, camps, after school activities, birthday party ideas, college planning, and health and wellness products and services. Some of the classes children can share with their parents and grandparents are tap and ballet, crafts, engineering, book reading, music performance, and gaga. Free valet parking, introduced in 2014, will be offered again. Meet QuackerJack from the Long Island Ducks. Be entertained by a juggler from the Big Apple Circus. Meet Amy Marchany, Ms. Royal America 2011-2012. Get your face painted by Risa’s Smiley Time Kiddie Parties. Take the Latin Jelly Brain Challenge with Village East Gifted. Taste a yummy green smoothie from health coach Peter Catalano. Get a foot health consultation from North Shore Podiatry, PC. See the Amelia Earhart Simulator from the American Airpower Museum. Get Child ID Kits from New York Life. Bring non-perishable food and money for donation to The INN (Interfaith Nutrition Network). Those who do will receive raffle tickets to win a variety of donated prizes. Take a few minutes to join the national bone marrow registry and possibly save the life of someone with blood cancer. Penelope’s Odyssey will be offering simple cheek swabs. Sponsors this year are LongIsland.com, Long Island Parent Magazine, Your Local Kids Source, Kiddie Academy Education Child Care and Macaroni Kid. Admission for age three and up is $5.00. Kids age two and younger attend for free, and there is no charge for a grandparent who is accompanied by a parent and child who have tickets. For complete information about All Kids Fair classes, a current list of exhibitors, and available ways to participate, including advertising, visit www.AllKidsFair.com or contact Barbara Kaplan at 516-621-1446. The Fair is produced by Specialty Connections, www.SpecialtyConnections.com, which also coordinates events at area malls. Subject: LongIsland.com - Your Name sent you Article details of "5th Annual “All Kids Fair” Offers Families Fun Opportunities"